This morning I started out fresh, sawing the rest of my “face packet”. The sawing was going well, the 2/0 blade cuts much smoother than the skip tooth we started with. It’s also really fragile, I broke several blades threading it through the pack when changing locations. Apparently this packet is about the limit of thickness for using the 2/0 blade (four veneer sheets plus the front and back blanks and grease paper). I’m not saying that’s why the blade broke, that’s all operator error. I was able to follow the line much better this morning, and sawed out the remainder of this packet pretty quickly (and reasonably accurately). Close up of a saw blade in my eye – the eye is mostly sawed out at this point. It gets taped in place and doesn’t come out of the packet until it’s opened layer-by-layer at the end. If you’re not familiar with the tool we’re using to saw the packets, this in my workstation. It’s called a “Chevalet”, or “Marquetry Chevalet”. 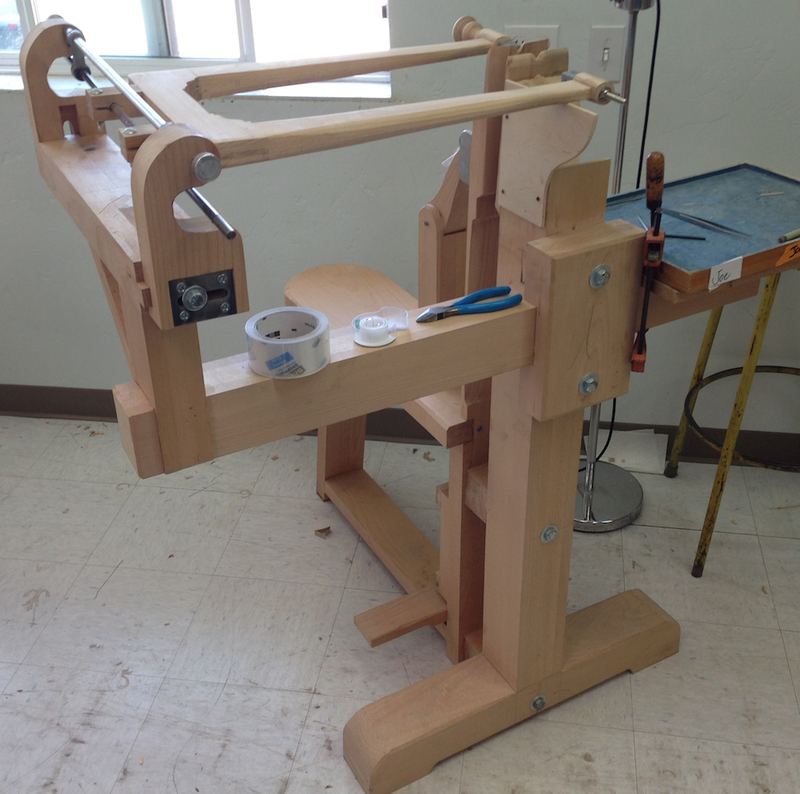 There is a foot pedal to control the clamping motion of the jaws, and of course the saw frame. The saw frame guides the saw so that the cuts are always exactly perpendicular to the vise in both horizontal and vertical directions — very important when sawing out multiple layers like this if you want them to fit back together. After sawing out the packet I moved over to a work table where I opened the packet, stripping out one layer at a time, and arranging the parts relative to each other. Backgrounds on the lower part, islands on the top part. Then I shifted the backgrounds for the best contrast with the other parts and glued them face-down onto the assembly board with hot hide glue. The assembly board is a piece of scrap wood wrapped in special brown paper. It’s stretched tight onto the face of the board, but not glued to the face of the board. You apply a layer of hot hide glue, place the background face down in the glue, then fit in all of the pieces, finishing by applying a clear plastic caul to hold it all flat. Unlike the first project that looks like it was done by a blind quadriplegic, this one looks much better. 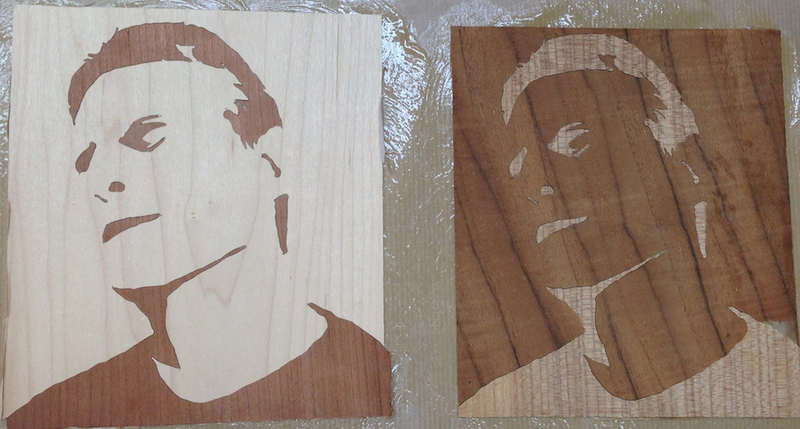 Later we’ll fill the saw kerf with goop and glue these down onto a backer board so we can finish them. Or we’ll fling them across the room, it could go either way at this point. 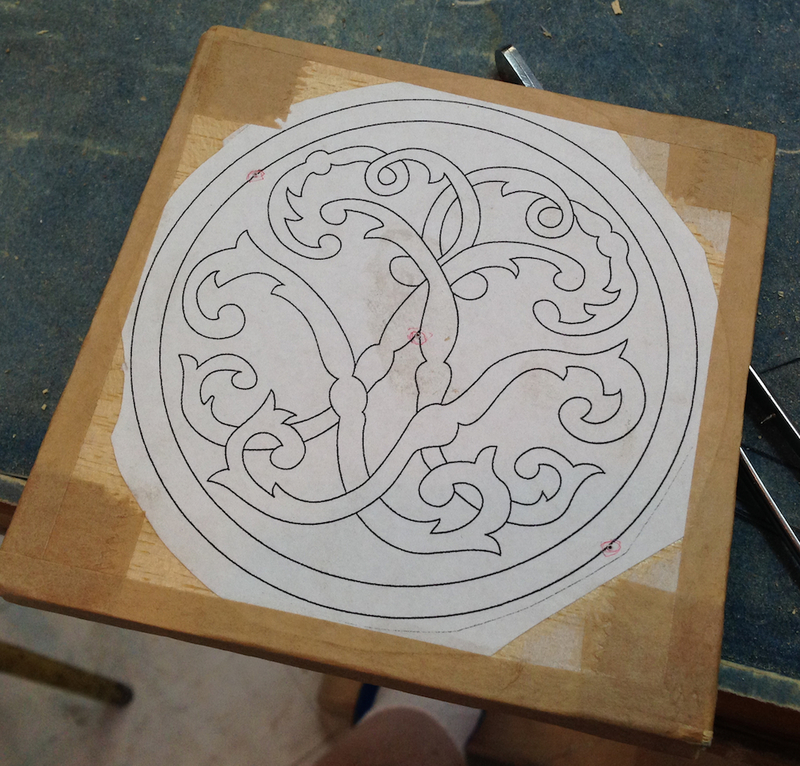 We started in on the third project, a set of coasters. 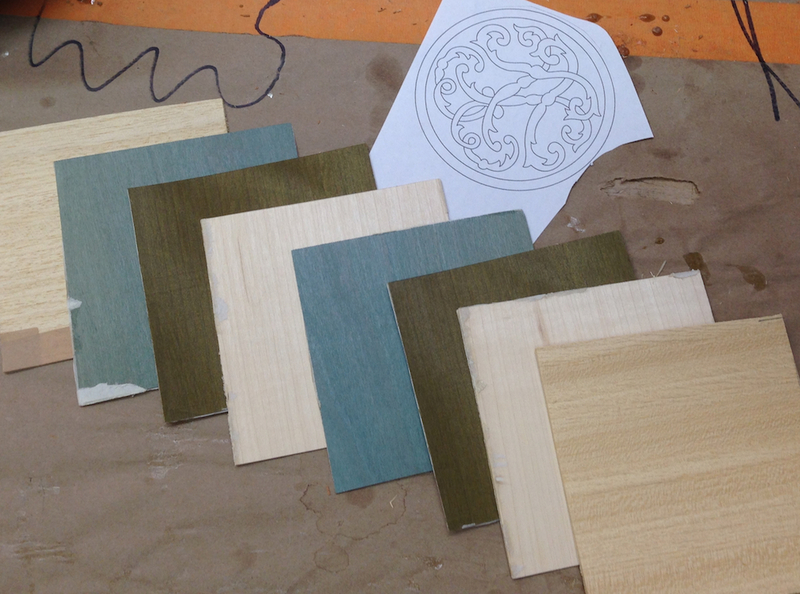 Six layers of veneer in three different colors. I’m not feeling the love with this one, it’s exactly the kind of project that will show every single twitch of the saw blade. The process to build the packet starts with the 3mm backer board followed by a double layer of grease paper, followed by the first piece of veneer face down. The veneer sheets inside the packet are oriented vertically, and the front and rear waster boards are oriented horizontally. Each sheet of veneer is table down to the backer board individually with short pieces of gum tape. The design is hide glued to the front, and eventually the entire packet is wrapped with brown gum tape. Three tiny holes for the saw blade are drilled with a #60 bit (that’s tiny). I sawed out the first few sections and had to call it quits because I was getting too frustrated. I was following the lines OK, but any little blip shows up and it looks like hell. Maybe the morning will bring sawing joy. I really want to learn how to do this, but I’m really short on patience this week for some reason. Your experiences recall all of the frustrations I experienced at ASFM the first few days. The first pattern you cut was the same as we used in two classes for Northeastern Woodworkers Association. This was the only project cut in two and a half days and the students did not have the high tech chevalet. No, they used six inch fret saws with 2/0 jewelers blades and a birds mouth platform (adjustable in height for comfort). Chief problem was keeping the saw blade as near perpendicular as possible. Some students excelled and some were way less so and spent a lot of time searching for errant pieces. 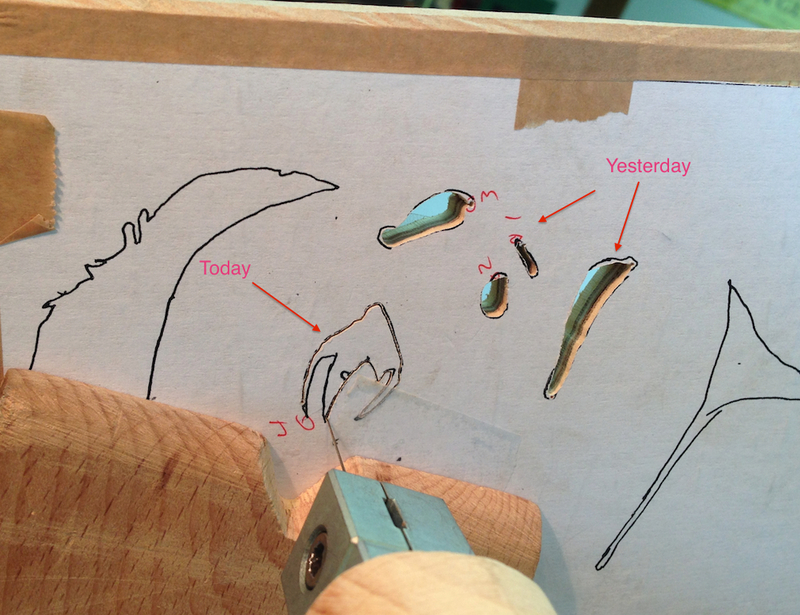 Part of that was my fault for using too thin veneer but some students caught on quickly. I can also testify that searching for pieces of veneer is a lot easier than the same activity seeking a 1/16″ brass clock bushing on a maple floor the same color! But that’s another story. We did the portrait project which was difficult for me but with Patrick and Kristen’s help a pattern was developed. The value of this exercise was not evident until they were glued up and the effect of different foreground/background combinations are seen. It’s an exercise in training you eye/mind to color values. At one point Patrick gave me the 2/0 blade to use after I had broken a dozen no. 2 blades and also with the difficulty of following the line. Life was much better after that. I think he was worried that I would break his budget! You no doubt have been instructed to keep the blade in the notch of the jaws, push it straight and turn the pattern as needed. I found it easier to think of making the line meet the blade not try to follow the line with the blade. It was a mental trick but seemed to work. Good luck with the rest of the class. Although I appreciate your blog efforts, it might be simpler to just concentrate on what ASFM has to offer. Good marquetry demands close concentration. Don’t drive your chevalet while distracted! Relax Joe. If you were an expert at this you wouldn’t be taking the class. Your there to learn a new skill. Focus on the learning, not the result of these projects. Judging from what I’ve seen on this blog you’ll perfect the techniques your learning in short order. I’m glad to see that you are progressing. After yesterday’s post, I thought I might see some flames in today’s pictures. Keep at it, you’ll get it.